By car: highway A 25 to the Celano or Pescina exit. Follow indications for Bisegna (or Gioia dei Marsi-Rifugio del Diavolo); Highway A 1 to Frosinone exit following signs for Sora-Forca d'Acero. By bus: Abruzzo bus lines are connected to the centres of Avezzano, L'Aquila, and Pescara by ARPA lines. From Lazio, COTRAL buses arrive, and during summer months there is a direct bus to Pescasseroli from Roma and Napoli. By train: the Roma-Pescara line goes as far as Avezzano, while the Sulmona-Isernia line reaches the Alfedena station from the South. In Brief: The Abruzzo, Lazio and Molise National Park has dedicated 80 years to the creation of a protected area which stands out nationally for its number of structures and actions performed for the conservation of nature and the protection of the environment. The work performed over the years has led to widespread appreciation of the Park. Out of 62 structures, visitor centers, area offices, shelter, museums, and animal sanctuaries, 45 of them along with three natural paths are accessible to visitors with mobility limitations such as children, elderly people and people with disabilities. Itineraries: It is possible to visit the Park taking any of the 150 walks described on Parks tourist maps available in each of the Park Authority Offices. The ideal time to visit the Park is from late spring to early autumn, before snow covers the region. Amongst the different itineraries in the Park one is particularly fascinating: it is the one that begins at Civitella Alfedena and leads to the Forca Resuni Refuge lodge passing through the Val di Rose, Lago Vivo, Camosciara, Prato Rosso Refuge, and Val Fondillo. In Pescasseroli the Park Museum and Animal Park can be visited. 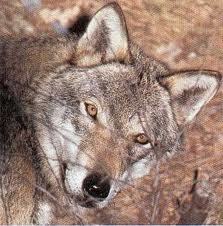 Nearby the town of Civitella Alfedena there are the Wolf Museum and Wolf and Lynx Wildlife Area. The town of Villavallelonga hosts the Deer Museum and in the town of Opi there is a Chamois wildlife area. In some of the Park's shelters, overnight stays can be requested by writing to the Park Authority offices in Pescasseroli or in the other towns above mentioned; please consider that only the offices in Pescasseroli and Civitella Alfedena are open all year round. In addition to the Park's natural landscapes, the inhabited areas are rich in history and worthwhile visiting. 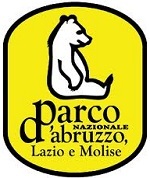 Park Outline: The Abruzzo, Lazio and Molise National Park is one of the oldest in Italy. It has been functional for more than 80 years. Aside from the Abruzzo region from which it takes its name, the Park expands also into the Lazio and Molise regions, hence its new title of Abruzzo, Lazio, and Molise National Park approved by law in 2001. The Park protects wildlife areas that help reconstruct a view of the Apennines in ancient times. The Park's landscape is mountainous, although the peaks are not very high: the Petroso mountain (highest in the Park) soars 2.249 meters. Almost all the Apennine characteristics are present in the Park, such as mountains, slopes, hillsides, woods, pastures, beech, mix deciduous and pine forests. The presence of both surface and subterranean water is another important characteristic of the Park. The springs of the Sangro River are in the Park. The Sangro River gains force with numerous torrents as it descends into the valley and two artificial lakes have been created in Barrea (on the Sangro) and Grottacampanaro in Val di Comino. The Park's only natural lake is Lago Vivo. The lake is small but beautiful, fed by a subterranean water system and by water that melts from snowfall. The mountains of the Park show signs of centuries of agricultural history. Until 50 years ago, thousand of sheep grazed in the area until autumn when they were transferred to the Puglia region along historical tracks, this practice is called transumanza. Today, sheep farming is slowly losing its status as an economic resource towards tourism. Wildlife: The most predominant characteristic of the Park's vegetation is the presence of woodlands and forests that contain trees more than 500 years old. Beech forest plant communities are the most common and the dominant canopy species are: Neapolitan maple, Sycamore, Yew, Holly and Silver birch. At lower altitudes there are deciduous oak such as the Turkey oak and the Downy oak together with the Field and the Montpeler maple and the Mann ash. Along the rivers the White willow, the Hornbeam, the Black poplar and the Large leaved lime trees are common. 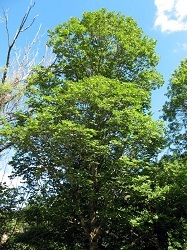 In specific climactic and environmental conditions, several small formations of Sweet chestnut trees and sporadic growths of Mediterranean maquis with Holm oaks are present. One of the most interesting aspects of the Park's vegetation is the presence of the Villetta Barrea Austrian pine, a species endemic to this part of the Apennines. 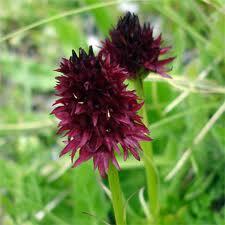 It develops primarily on the dolomite rocks of Camosciara and in the surrounding areas. Between the Beech forest belt and the mountain prairie there is a typical vegetation structure with shrubs of the Mugo pine and the Dwarf juniper. The floristic composition of the native herbs in the Park consists of numerous rare and endemic species; between the most beautiful there are the Black vanilla orchid, the Red lily, the Martagon lily, the Common peony, and the Great yellow gentian. The rare Venus lady's-slipper orchid is a specific orchid of this part of the Apennines and is present elsewhere only in some locations on the Alps; also the Marsica iris is an endemism present in the area. To give a clearer picture of the vast plant life in the Park, there are more than 1,200 species of vascular plants. From an animal perspective too, the Park is truly unique: it is the only place in Italy where most of the species of mammals that once inhabited the Apennines are still present. 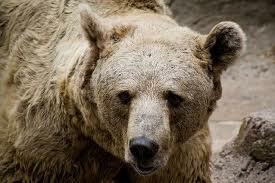 Amongst these mammals the fascinating Marsicano's bear is the Park's symbol, about 70-80 of the species are scattered throughout the forests. Another unique animal is the Abruzzo chamois (quite different from its alpine ancestors), which can be easily observed along some of the highest paths of the Park. The population of this noble animal, which faced extinction a few decades ago, has now been built up to about 500 individuals. In addition, several dozen Wolves prowl the mountains of the Park, hunting Red deers and Roe deers that were reintroduced into the Park during the 1970's (stumbling upon Roe deer is difficult in the Park, while Red deer sightings are more common). Wildcats, Pine martens, Steenmartens, Badgers and Wildboars are also found on the scene in harmony with birds such as the Golden eagle and the rare Lilford woodpecker. 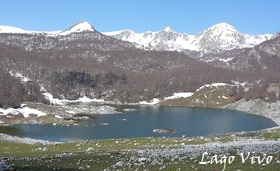 Bushwalkers who wander along the high mountain trails may see the Chough, the Snowfinch and the Black redstart. In the woods, Jays and Green woodpeckers can be seen while the Buzzard and other lovely birds patrol the skies. On the lakes aquatic birds such as Grey herons and Ducks can be seen. Obviously, there are plenty of insects abound, including some rare species. History and Culture: The Abruzzo, Lazio and Molise National Park is one of the oldest Italian national parks. It has always been considered one of the main sites of conservation of nature in the country, it is exemplary in showing that Italian parks are the places that best display the ideal relationship between human beings and nature. The search for a possible balance between the activities of anthropogenic communities and the resources offered by natural environments is rediscovered in the design of the land, developed in occupied land and countryside, insinuated within woods and pastures, and unravelled along the course of migrations. Typical of the mountainous countryside and the pastures are the abandoned areas of Mt. Marsicano, displaying the life and activity of man in these mountains. 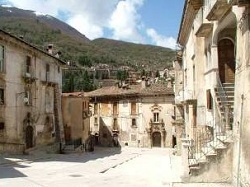 The towns of Opi and Civitella Alfedena are valid examples of historic centres built as an attempt to find the best possible adaptation to the site, environmental conditions, and historic and socio-economic requirements; in both towns, houses were built in limestone, tiled roofs, wooden accessories and fireplaces traditionally used to heat houses. 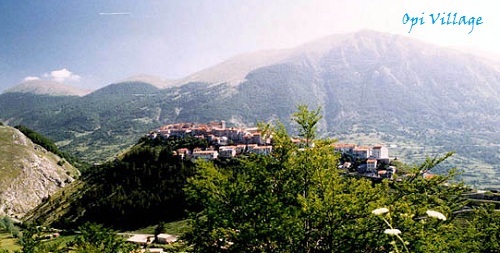 The town centre of Opi is developed in such a way that gives preference to the mountain ridge and the longitudinal articulation along the main road, while Civitella Alfedena is perched at the foot of the mountains. The town centre of Villetta Barrea and Pescasseroli, home to noble families, boast several patrician palaces. The town of Scanno, although outside the Park, is strongly tied to it. This town has a beautiful historic centre characterized by long rows of old houses. At the edge of the Park, at the foot of Mainarde on the Molise side, lie the towns of 'Cerro al Volturno' with its magnificent castle and Rocchetta Volturno with the lovely San Vincenzo Abbey, site of significant importance throughout the medieval period. 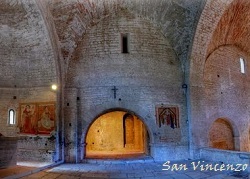 This abbey contains the crypt of Abbot Epifanio and several treasured frescoes of the 9th century. Major historical events have left their mark on this region. The presence of Benedictine monks diffused and kept alive the Christian culture for all of the medieval period in the valleys with the Abbeys and Monasteries such as the San Vincenzo al Volturno. The Saracens sacked the borgos and countryside during the 9th century but also enriched the culture and developed the village of San Biagio Saracinisco. Abruzzo Typical Products and Craftwork: The local inhabitants carry out ancient practices of herding and agricultural activities tied to a subsistence economy. Still today, with the help of modernization, one of the main resources of the inhabitants is agriculture, along with all the activities that lead to the harvesting of vegetables. There are rural woodcraft and wrought iron as well as suede industries that survive locally. 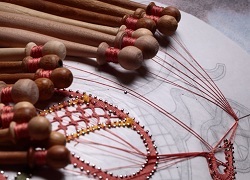 In Scanno, lace crafting and embroidered pillows, gold and silver threads and embroidery used for making religious objects are also produced. 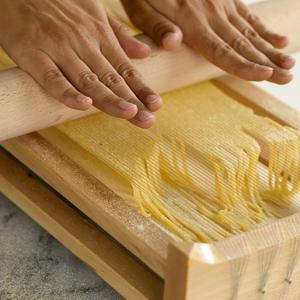 Typical foods are spaghetti alla chitarra (home made typical pasta), ravioli filled with ricotta and cheese, grilled lamb, pecorino and grilled scamorza. Typical desserts such as Pan dell'Orso made with almond cream and chocolate and pan di spagna made into shapes of dolls or horses for children, are usually made in Gioia dei Marsi.